Where are my scraped media and metadata saved? Scraping is a way to get metadata, boxart and video previews (snapshots) for your games from the internet. If the scraper isn't working either you are not connected to the Internet or source site may be down or overloaded and in that case you'll just have to wait until it comes back up. Scraping adds extra information to the game - Publisher, Developer, Release year, Genre, Description, Number of Players supported and Rating. Since EmulationStation 2.1.0 you can have a video preview as scraped art, provided that is's supported by the theme EmulationStation is using. The built-in EmulationStation scraper, which pulls information from TheGamesDb.net or ScreenScraper.fr. Steven Selph's Scraper (scraper), which pulls information from TheGamesDB.net, ScreenScraper.fr, OpenVGDB, ArcadeItalia.net. It can also use your local media for scraping, adding it to EmulationStation's gamelist. Lars Muldjord's Skyscraper (skyscraper), which pulls information from TheGamesDB.net, ScreenScraper.fr, OpenRetro.org, MobyGames.com, IGDB.com and WorldOfSpectrum.org. It also has the ability to import your local media into the final gamelist. EmulationStation has a built in scraper that pulls from TheGamesDB or ScreenScraper. It can be accessed from the main menu in EmulationStation, opened by the Start button. Note: during the first scraping session using TheGamesDB as scraping source, Emulationstation will download additional information (list of publishers, developers, genres) from TheGamesDB. The scraper will seem unresponsive for a very short period of time - depending on the download speed - but after the necessary information is downloaded and saved, the scraping will resume. Any subsequent scraping operations will re-use the downloaded information, without any additional downloads. If you are having issues with your metadata changes not being saved, you need to select Quit EmulationStation from the quit menu rather than shutdown or restart system. Then your changes will be saved. (Optional) If you are remotely running this script you must be logged in with pi user, otherwise it will confuse the scraper. Quit EmulationStation (from the start menu or press F4) and type sudo ~/RetroPie-Setup/retropie_setup.sh. Choose Manage Packages then Manage Optional Packages. Select scraper and install the package. It may take some time for the xml files to build. This will also only work if your roms are located in the local roms folder and not on an external device. If your roms are located on another source than the default one, you can download the stand alone releases from sselph's scraper releases. Please refer to Sselphs Scraper Advanced Configuration when using this method. Make sure to update to the latest version of Retropie-Setup script if you're missing any options mentioned below! 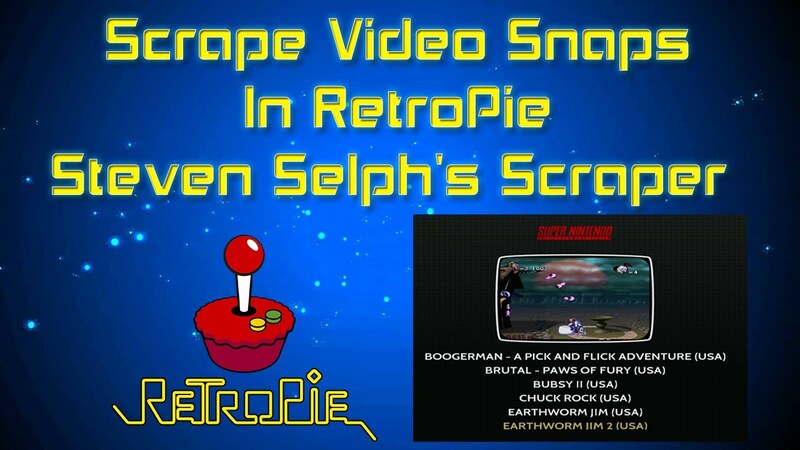 Scraper is started from inside the Retropie Setup Menu. Navigate to Manage Packages > Manage Optional Packages and select scraper. 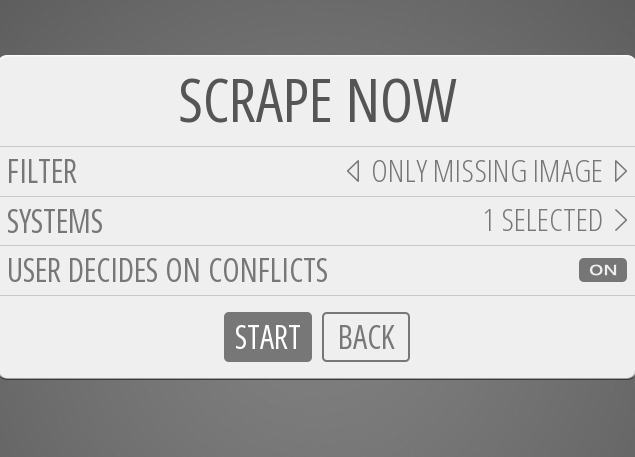 You will navigate to the Choose an option for scraper window. Select option C Configuration / Options. It will take you to the window shown below and allow you to run/configure the various functions of the scraper. 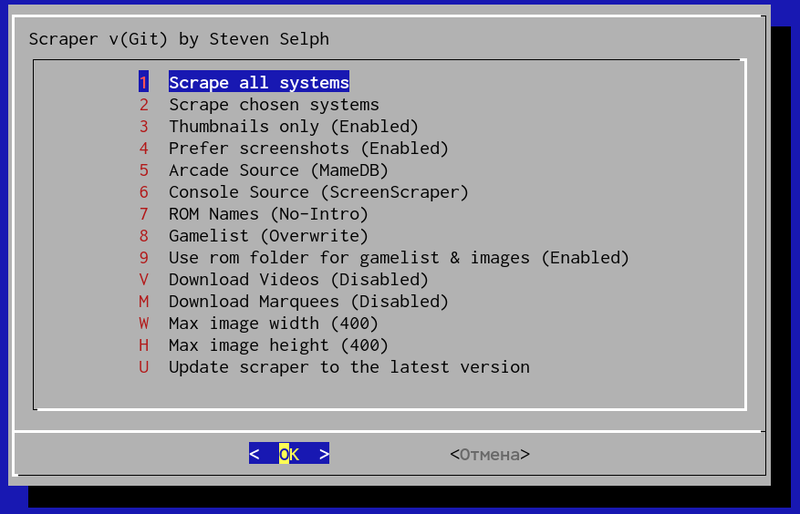 Scrape Chosen Systems: You can choose to only scrape the systems you choose (press the spacebar to select each system) and select ok to start scraping. Thumbnails Only: When enabled it will load lower resolution images to save space (enabled by default). 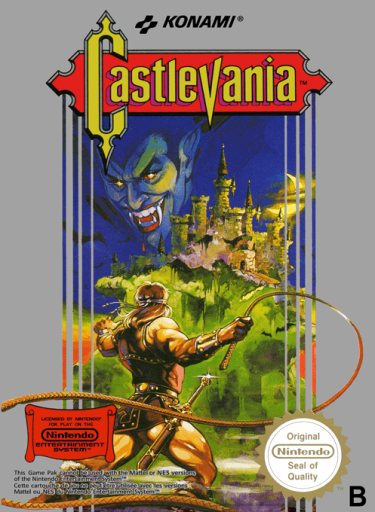 Prefer screenshots: When enabled it will load screenshots of the games instead of box art. Max Image Width/Height: Specify the max image width or height to scrape. Gamelist: Choose to overwrite the existing gamelist.xml or append to it. 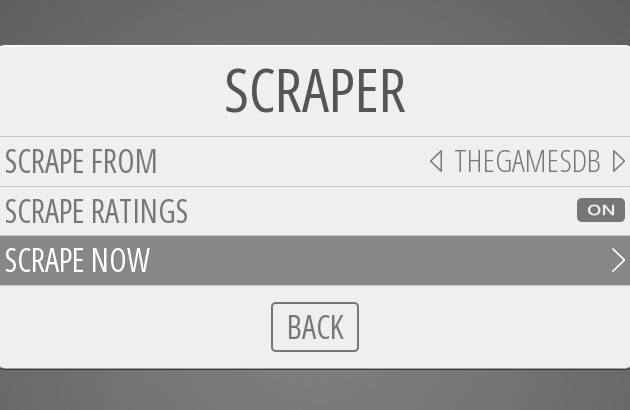 Update scraper to the latest version: This updates the scraper to the latest version. If true, add roms that are not found as an empty gamelist entry. If the gamelist file already exist skip files that are already listed and only append new files. Comma separated list of extensions to also include in the scraper. The file containing hash information. Use N worker threads to process images. If 0, then use the same value as workers. If true we want to run in MAME mode. The max height of images. Larger images will be resized. 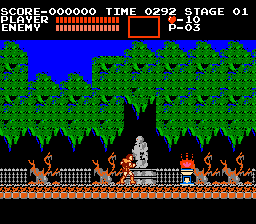 The file where information about ROMs that weren't scraped is added. Use a nested img directory structure that matches rom structure. Don't add thumbnails to the gamelist. If set it will truncate the overview of roms to N characters + ellipsis. Information will be attempted to be downloaded again but won't remove roms that are not scraped. If true, scrape all systems listed in es_systems.cfg. All dir/path flags will be ignored. Skip the check if thegamesdb.net is up. The password for registered ScreenScraper users. The username for registered ScreenScraper users. If true, remove all non-ascii characters. Download the thumbnail for both the image and thumb (faster). If true, use the filename minus the extension as the game title in xml. Print the release version and exit. 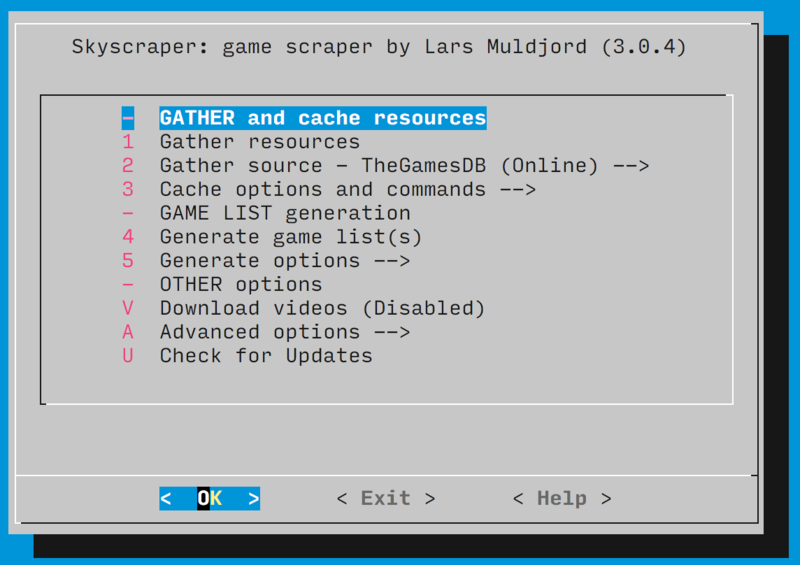 Skyscraper by Lars Muldjord is a powerful and versatile yet easy to use game scraper written in C++ for use with multiple frontends running on a Linux system. It scrapes and caches various game resources from various web sources, including media such as screenshot, cover and video. It then gives you the option to generate a game list and artwork for the chosen frontend by combining all of the cached resources. For a more thorough description of any functionality described here, please check out the official Skyscraper documentation. Choose Manage Packages then Manage experimental packages. Select skyscraper and install the package. Make sure to update to the latest version of Retropie-Setup script if you don't have skyscraper as an installable package ! Skyscraper can be used to generate scraping information for both EmulationStation and AttractMode. Installing skyscraper as a RetroPie package will automatically configure it for EmulationStation, but if you wish to use it for generating AttractMode metadata, you can use Skyscraper from the command line. Check the official documentation for a list of all command line options. The recommended usage is to scrape your system(s) by gathering data (image/videos/information) from as many online sources as you'd like. All of the data will be cached while doing so. 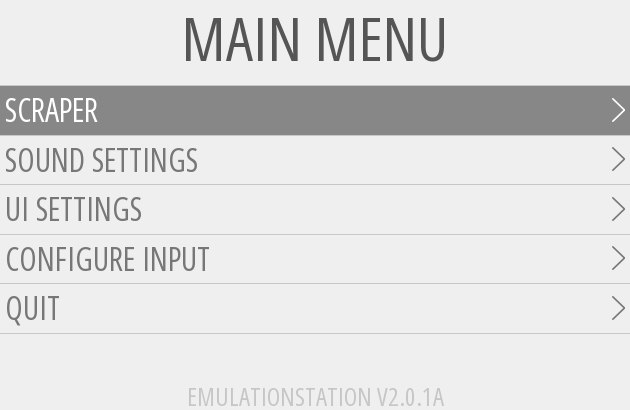 Then, when you have gathered enough data, be sure to generate the game list for Emulationstation from the cache. This will combine all of your cached data into the most complete results for each rom. Skyscraper can be started from the RetroPie-Setup script, opening the Configuration/Tools menu and choosing skyscraper.If you wish to run it from the command line, for more advanced options and parameters, you can find it installed in /opt/retropie/supplementary/skyscraper/Skyscraper. Gathering (scraping) the information from online sources and caching it on your system. You can repeat this action as many times you want, changing the gathering source or choosing which platforms (systems) you want. Generating the EmulationStation game list files (gamelist.xml) using the information from the populated cache. Gather resources: This will gather information/media only for the systems you choose. 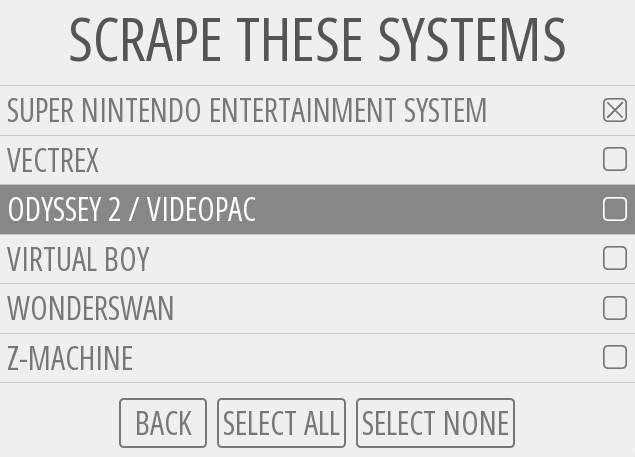 Press Space to select each system you wish to include and OK to start scraping. LOCAL: import -- imports resources into the resource cache. Read more about this here. NOTE: Some online sources require a username/password for using them. You can add this information by editing the config.ini configuration file (from the Advanced options menu). INFO: Skyscraper supports IGDB and MobyGames as gathering sources, but they are not integrated into the RetroPie script menu. If you wish to use them, you'll have to use it from the command line. Gathering options is a sub-menu used to configure various aspects of the gathering phase and of the information added to the cache. You can also use this sub-menu to remove information from the cache, in order to free up space or get rid of unwanted information. Cache screenshots: toggles the download and caching of screenshots from the scraping source into the resource cache. Cache covers: toggles the download and caching of covers from the scraping source into the resource cache. Cache wheels: toggles the download and caching of wheels from the scraping source into the resource cache. Cache marquees: toggles the download and caching of marquees from the scraping source into the resource cache. Force cache refresh: Skyscraper caches the media retrieved from online sources to speed up scraping and to combine multiple sources of information to give you the best scraped information available. This option forces the scraper to bypass the resource cache and re-download the resources from the online sources during the gathering action. NOTE: Use this option sparingly. Skyscraper automatically downloads missing media for new ROMs, so it's only needed if your really want to re-download the ROM media from online sources. Skyscraper caches locally the media downloaded from online sources. In time, this cache can grow and consume a considerable amount of disk space - especially if videos have been enabled. The cache size is displayed on top in this menu screen. Vacuum chosen platform: deletes the locally cached resources that don't have a ROM/Game file anymore. Useful to clean up space after deleting ROMs. Purge chosen platform: deletes all the locally cached resources for a chosen platform. Purge all platforms: deletes all locally cached resources, for all platforms. NOTE: use these options with care, they will completely remove the cached resources. Generating game lists after you've cleared the cache requires you to re-download the media from the scraping sources all over again. 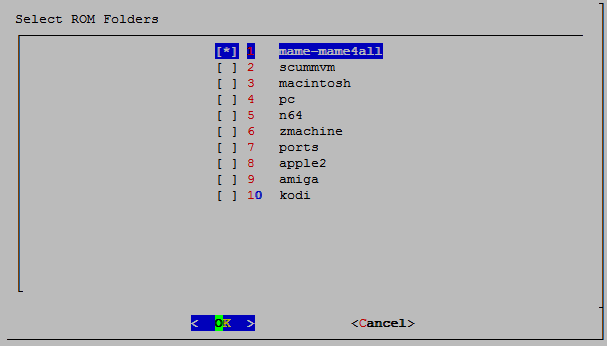 Generate game list(s) This will generate the EmulationStation game list(s) for the systems you choose using all previously cached resources. Press Space to select the system(s) you wish to include and OK to start the generator.. Source name use the name pulled from the scraping source (default). Filename use the file name of the ROM. Remove bracket info: Choose to remove (Enabled) or keep (Disabled) the text between brackets. If the name of the ROM is Super Mario World (USA)[! 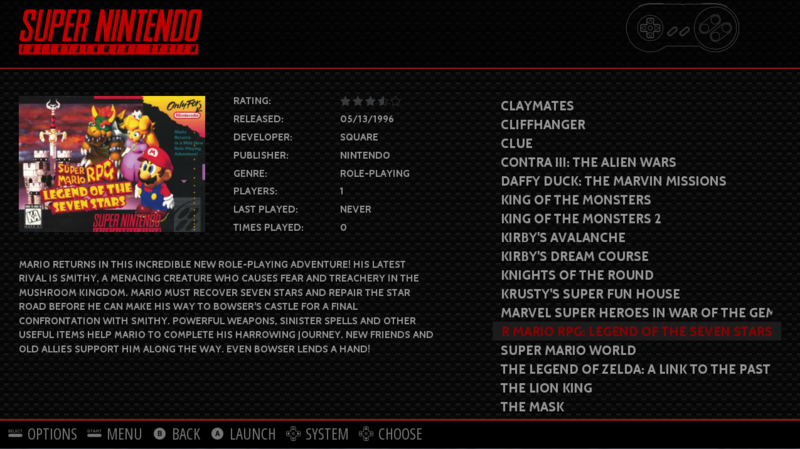 ].sfc, enabling this option will make the ROM show as Super Mario World in EmulationStation. Conversely, when disabled, the text between brackets will be added to the ROM's name in the gamelist. When Enabled, the gamelist.xml and the media will be written to the ROMs folder. When Disabled,the gamelist.xml and the media will be written to the EmulationStation configuration folder - $HOME/.emulationstation/gamelists and $HOME/.emulationstation/downloaded_media. Download Videos: Choose to toggle the download and caching of videos for the ROM names and also if videos are added to the game list for EmulationStation. NOTE: Be aware that gathering and caching videos could take up a lot of disk space. Check for Updates will check if a new Skyscraper release is available, giving you the option to update to that release. If you wish to edit the configuration files or use the Import module, you can do so directly on the system where RetroPie is installed or over the network from another computer. Skyscraper allows you to fully customize the final frontend artwork by composing the media resources scraped, through the artwork.xml configuration file. 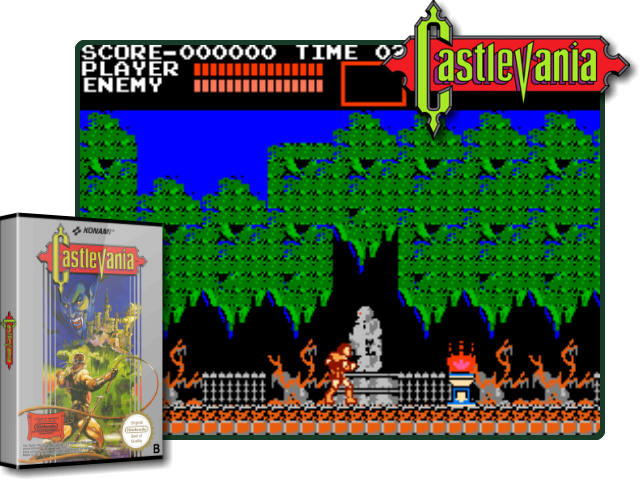 Here's an example combining a game's screenshot, its cover and the wheel media files into the final image. Consult the official artwork documentation on the artwork customisation. If you have your own media, Skyscraper can import it and use it for scraping your ROMs. Consult the official import documentation to understand how to use this feature. You'll notice after adding lots of ROMs and scraping them that your boot and shutdown time can increase substantially - some solutions to speed up your boot and shutdown times are described HERE. Remember: if you are going to edit manually any gamelist.xml you need to quit EmulationStation first !